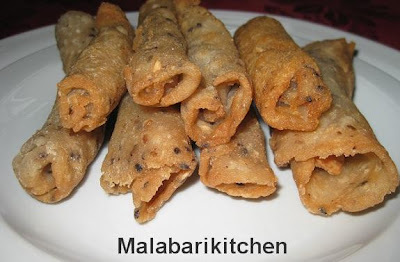 This is a very tasty crispy tubular shaped snack from Kerala coated with light sugar syrup. 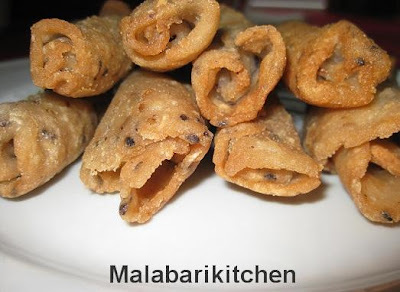 You will find this in any bakery in Kerala. This is a good tea time snack. Children will love it any time. Grind it and make fine paste. =►Grind all the ingredients mentioned above in the grinding section. 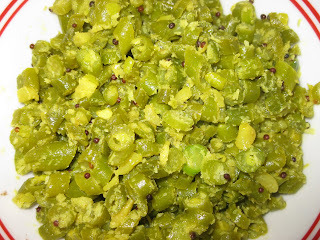 =►Mix well the slightly roasted rice flour, sesame seeds and the above grinded paste. =►Boil one cup of water with ¼ tsp of salt. =►When it boils add mixed rice powder and stir it continuously and reduce the flame. =►Allow it to cook for 1-2min on sim flame and switch off the flame. 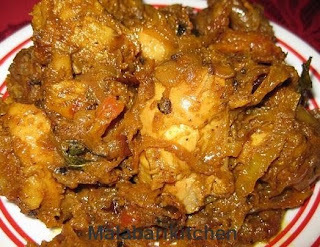 =► Make a dough out of this and if it is very stick add little rice powder to make it non sticky. =►Knead it well and make small balls like you make for poori (smaller than chapatti). =►Press it till it becomes in the shape of a poori. =►Then roll it lengthwise using fingers. Place the dough on your middle finger so that it gets a cylindrical shape. Remove the dough from the finger so that it is void from inside like a PVC cylinder. =►Heat oil in a pan and fry(deep fry) it until it becomes light brown in color. =►Make thick sugar syrup and pour it over these. Note – If you want more sugary you can dip the fried Kuzhalappam in sugar syrup.